The outermost layer filters out the largest dust particles. Innermost layer Preserves the respirator's shape. P1 Class of Filtering Efficiency & CLI tested. Middle layer is Composed of Electrostatic filter Media. All dust Particles sizes 0.3 micron dust are the most difficult to filter Effectively. 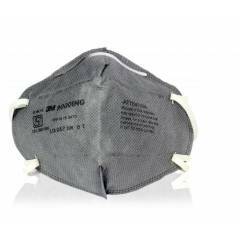 3M 9000ING Dust/Mist Antipollution Grey P1 Respirator Mask (Pack of 20) is a premium quality Respiratory Masks from 3M. Moglix is a well-known ecommerce platform for qualitative range of Respiratory Masks. All 3M 9000ING Dust/Mist Antipollution Grey P1 Respirator Mask (Pack of 20) are manufactured by using quality assured material and advanced techniques, which make them up to the standard in this highly challenging field. The materials utilized to manufacture 3M 9000ING Dust/Mist Antipollution Grey P1 Respirator Mask (Pack of 20), are sourced from the most reliable and official Respiratory Masks vendors, chosen after performing detailed market surveys. Thus, 3M products are widely acknowledged in the market for their high quality. We are dedicatedly involved in providing an excellent quality array of 3M Respiratory Masks.